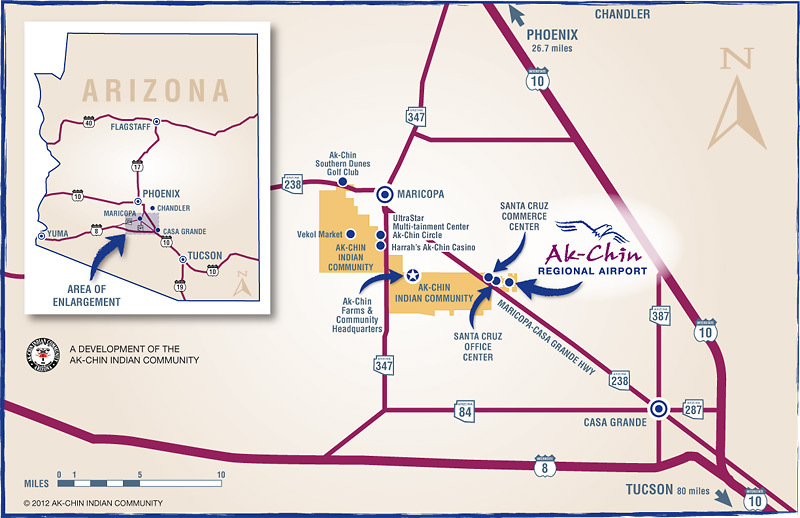 The Ak-Chin Indian Community Reservation is located in the Santa Cruz Valley of the Sonoran Desert. President Taft created the reservation by executive order in May 1912 and originally set aside 47,600 acres, but later that year reduced the Tribe’s land base to its current size of 21,840 acres. The Tribe has about 947 members. Traditionally, the Community met its needs with groundwater from beneath the reservation and the federal government originally sought to extract the tribe’s entitlement from this source. However, increased agricultural and domestic development reduced the water table, forcing the tribe and federal government to seek other sources. After a series of settlements, it was decided that the Tribe would receive CAP water with an early priority date. 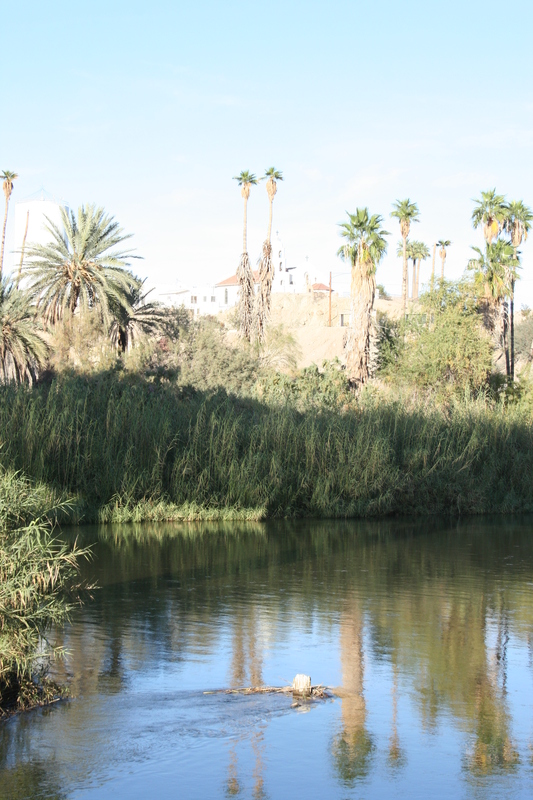 The Community’s water sources are the mainstem Colorado River and CAP water. 50,000 afa of Colorado River water was reallocated from three districts within the Yuma-Mesa Division of the Gila Project, with a pre-CAP 1947 priority date, delivered via the CAP system. The remaining portion, embodied in a CAP Indian–priority contract for up to 58,300 afa, was secured by the Ak-Chin Community’s CAP allocation. This quantity can be reduced in times of shortages, but the Community is always assured delivery of at least 72,000 afa. The Community’s entire entitlement is delivery of up to 108,300 afa and the smallest quantity assured is 72,000 afa. The 1978 Ak-Chin Indian Community Settlement Act was the first Indian federal reserved rights settlement to be implemented. Under the terms of this settlement, the Tribe was guaranteed 85,000 afa of groundwater, first to come from a temporary source and eventually assured by a permanent supply. The settlement obligated the federal government to deliver this water and in exchange the Tribe agreed to waive all present and future groundwater claims. This original settlement restricted the Tribe’s uses to agriculture and the Community received a total of 85,000 afa to irrigate 16,725 acres. The federal government guaranteed delivery to be extracted from groundwater, but supplies were ultimately insufficient. When the federal government failed to deliver the water promised in the 1978 Act, the Tribe threatened to sue for damages. Instead, Congress reauthorized the settlement in 1984. In this settlement, the Tribe receives a CAP allocation instead of the groundwater provision intended in the first act. Section (2)(a) of the 1984 Act requires the Secretary of the Interior to deliver “annually a permanent water supply from the main project works of the Central Arizona Project. . .of not less than seventy-five afa” except in “times of shortage.” In times of shortage the Secretary may reduce the Tribes’ supply to 72,000 afa. In wet years the Tribe may receive up to an additional 10,000 afa. Thus, the Tribe now receives 75,000 afa in normal years, 72,000 afa in dry years, and up to the original 85,000 in wet years. The 1984 Act also amended the use provisions of the 1978 Act, expanding uses to include unrestricted use and marketing for Ak-Chin water entitlement so long as the Community abides by Arizona State groundwater laws. In addition, the agreement provided money for irrigation system improvements. The State of Arizona originally opposed the 1984 settlement because it reallocated unused Colorado River water from the Yuma Mesa Irrigation District of the Gila Project to the Tribe instead of to other state appropriators. Generally, under Arizona law, any water unused by a senior contractor reverts to the State. Hence, this federal act flew in the face of state water law tradition. In 1992 the settlement was amended once again. The 1992 amendment allows off-reservation leasing in certain nearby counties and expands the potential market for Ak-Chin water. The Tribe uses a large portion of its land, and hence its water, for agricultural irrigation – approximately 15,000 acres of land are currently employed for that purpose. Water is also needed for municipal purposes, and the Tribe leases water to surrounding communities. Aside from the profitable Ak-Chin Farm, the Tribe garners income from its leases to the Del Webb Corporation. These leases include those on its industrial park, the Harrah’s Ak-Chin Casino, and a new entertainment complex that boasts movie theaters and a bowling alley. 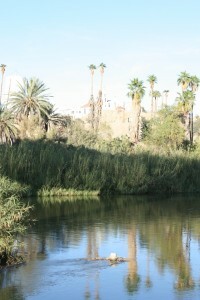 In 1992, Congress amended the 1984 settlement to authorize the Ak-Chin Indian Community to lease portions of its CAP water within the Central Arizona Water Conservation District (CAWCD), which consists of Maricopa, Pinal, and Pima Counties, but limited the term of any lease to 100 years. The 1992 legislation also expressly sanctioned a lease between the Ak-Chin and the Del Webb Corporation, which provided a water supply for a large development called Anthem, located north of Phoenix. The legislation allowed the Ak-Chin to extend and renew leases of their settlement water for off-reservation use, thus allowing leases of 100 years subject to renewal. Additional leasing terms in the Act include an explicit provision for Secretarial approval, assurance that leased water maintains the Tribe’s priority date, and explicit approval of off-reservation leasing. ( j)(1) The Ak-Chin Indian Community. . .shall have the right to devote the permanent water supply provided for by this Act to any use, including agricultural, municipal, industrial, commercial, mining, recreational, or other beneficial use, in the areas initially designated as the Pinal, Phoenix, and Tucson Active Management Areas pursuant to the Arizona Groundwater Management Act of 1980. . .The Community is authorized to lease or enter into options to lease, to renew options to lease, to extend the initial terms of leases for the same or a lesser term as the initial term of the lease, to renew leases for the same or a lesser term as the initial term of the lease, to exchange or temporarily dispose of water to which it is entitled for the beneficial use in the areas initially designated as the Pinal, Phoenix, and Tucson Active Management Areas pursuant to the Arizona Groundwater Management Act of 1980. (2) [T]he initial term of any lease entered into under this subsection shall not exceed 100 years and the Community may not permanently alienate any water right. In the event the Community leases, enters into an option to lease, renews an option to lease, extends a lease, renews a lease, or exchanges or temporarily disposes of water, such action shall only be valid pursuant to a contract that has been accepted and ratified by a resolution of the Ak-Chin Indian Community Council and approved and executed by the Secretary. The 2000 Act also ratified the 1996 and 1999 lease agreements between the Ak-Chin Indian Community, the United States of America, and the Del Webb Corporation. Using the Ak-Chin Indian Community Water Reclamation Facility, the Tribe continues to improve water services on the reservation, to upgrade residential supply systems, and to increase the health standards of sewer and waste disposal facilities. Ak-Chin Farms’ primary focus is on silage crops to feed cattle at nearby dairy operations. They also raise cotton, barley, wheat, alfalfa, and milo. Starting a farm was not an easy task since the Tribe lacked the experience and capital crucial to viable agricultural endeavors. “We didn’t have much experience,” Leona reminisced. “My brother Richard had farmed, but never like this.” However, “[t]he Community already had a farming tradition” and an indomitable spirit. By the early 1960s the Tribe sought the assistance of a local farmer to serve as a manager. But, to run a successful operation the Tribe still needed start-up money. Financing for the farm was not easy to come by. They sought financing from local banks. “But the banks wouldn’t loan to us because our reservation land was held in trust status. And the BIA wouldn’t give us any trust money because they said we would never make the farm successful.” Finally, the Tribe was able to make a direct contract agreement with the Anderson-Clayton Cotton Gin to receive financing for farming. This loan had to be paid off annually from the farm’s profits to enable continued financing. Leona explained that another hurdle was the lack of an organized tribal government. At the time, the Ak-Chin Community did not have a constitution, a tribal council, or any formal governance structure. Leona and her brother Richard believed that with a tribal council, they could convince the BIA to support the Community. Leona’s other brother Wilbert “Buddy” Carlyle, selected bits and pieces of example constitutions to piece together a comprehensive Ak-Chin Constitution. In 1961, the Tribe passed the Constitution and elected a tribal council. The driving force behind these efforts was the goal of starting an Ak-Chin cooperative farming operation. Unfortunately, both of Leona’s brothers passed away far too young. Richard Carlyle was killed in an automobile accident on April 19, 1965, at age 33. Buddy Carlyle died of health related problems in his early forties. Richard had been the driving force behind the Ak-Chin cooperative farming operation. Buddy was Ak-Chin Community Council Chairman for many years, and had been a strong advocate for the Tribe’s water rights. After Richard died, Leona took over in 1965 as Farm Board Chairman. Blessed with good health, Leona continued to work towards the goals her brothers had been striving to achieve. Leona had no doubts that she would continue to pursue a water settlement on behalf of the Community. Using designated farmland, the Tribe “put up a casino in what used to be a hayfield.” The Tribe began to invest the profits from the casino into other Community endeavors. With the money generated from the casino, the Community has been able to develop much needed-tribal departments and build houses for Community members. Today, the Ak-Chin Community runs one of the largest farms in the United States. The farm is presently doing “better than ever” and is now producing crops on approximately 15,000 acres. The Tribe grows alfalfa for dairies, barley, milo maize, potatoes,corn for silage, and various other crops Cotton flocks the fields and is processed by the Tribe’s very own cotton gin. Robert Glennon & Michael J. Pearce, Transferring Mainstem Colorado River Water Rights: The Arizona Experience, 49 Ariz. L. Rev. 235, 236, (2007), http://www.mpwaterlaw.com/docs/TransferringMainstemColoradoRiverWaterRights.pdf. Interview with Leona M. Kakar, 8/13/2013. Act of July 28, 1978, Pub. L. No. 95-328, 92 Stat. 409 (relating to the settlement between the United States and the Ak-Chin Indian community of certain water right claims of such community against the United States). Glennon & Pearce, supra, 236. Act of October 19, 1984, Pub. L. No. 98-530, 98 Stat. 2698 (relating to the water rights of the Ak-Chin Indian Community). With this reduction in supply, the timeline for the federal government to comply was extended to 1988. The Community was also awarded $15 million in damages, $3.4 million in economic development, and $25.3 million as loan forgiveness. The Ak-Chin Indian Community shall have the right to devote the permanent water supply provided for by this Act to any use, including but not limited to agricultural, municipal, industrial, commercial, mining, or recreational use. § 7(j), 98 Stat. Act of October 24, 1992, Pub. L. No. 102-497, 106 Stat. 3255 (to make technical amendments to certain Federal Indian statutes). Act of October 10, 2000. Pub. L. No. 106-285, 114 Stat. 878 (to amend the Act entitled ‘‘An Act relating to the water rights of the Ak-Chin Indian Community’’ to clarify certain provisions concerning the leasing of such water rights, and for other purposes). Representative John Shadegg, Statement of Administration Policy: H.R. 2647 – Ak-Chin Water Use Amendments Act, May 9, 2000, The American Presidency Project, http://www.presidency.ucsb.edu/ws/?pid=74766 (5 March 2013, 2:00 p.m.). 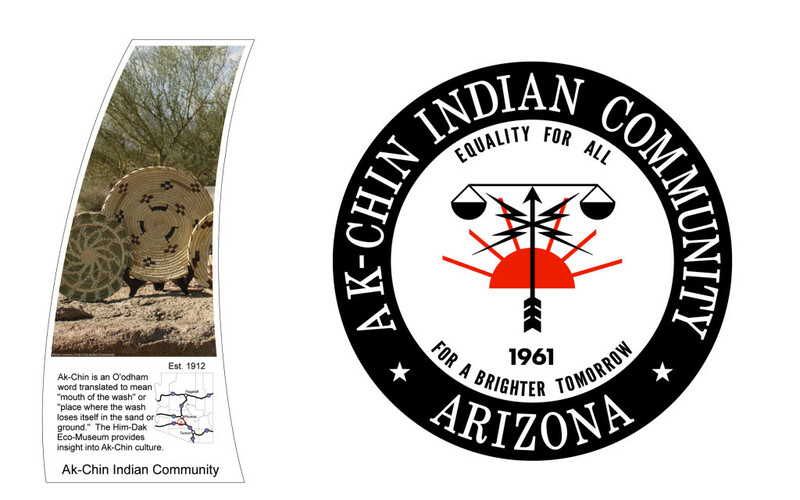 Inter Tribal Council of Arizona, Inc., Ak-Chin Indian Community, http://itcaonline.com/?page_id=1146 (5 March 2013, 1:30 p.m.). The 1984 leasing provisions were not without opposition. Arizona Representative Shadegg opposed the leasing amendments to the 1984 Ak-Chin settlement agreement. After emphasizing that “the Administration supports the efforts of the Ak-Chin to market its water” he expressed concern that the bill did not do enough to clarify the “core issues which concern the State’s regulatory restrictions on the time frame for the tribe’s leasing contracts.” Shadegg objected that the leasing provision permitted the tribe to lease water resources for up to 100 year periods and also did not restrict the tribe to a certain length or number of renewals. Shadegg expressed concern that “this diminishes the value of the water and could lead to de facto alienation of trust resources.” Another objection was that the bill included directive language that would place serious limitations on the Secretary of the Interior’s discretion in leasing trust resources. Shadegg, Statement of Administration Policy, supra. In a lease to Del Webb, there are specific provisions designed to afford the Community protection in years of shortage. In shortage years, Del Webb must pay the Community an additional charge per-af leased. The charge is based on a formula that incorporates the cost of CAP water. The parties defined shortage themselves in a manner different that shortage is addressed in the 1984 Act.